Mr. Brainwash 1 from Bond vs. Brainwash by Gavin Bond invites us into the crazy and colorful world of French graffiti artist, Mr. Brainwash. In Bond v Brainwash, Gavin Bond invites us into the crazy and colorful world of French graffiti artist, Mr. Brainwash. 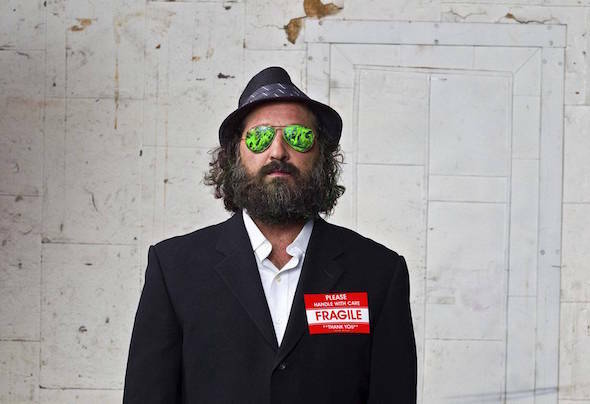 Rising to fame due to a heavily hyped exhibition and a Banksy-directed documentary entitled, “Exit Through the Gift Shop,” the French artist Mr. Brainwash was once a clothing store owner named Thierry Guetta. He moved to Los Angeles long before neither he nor his family knew that he would become one of contemporary art’s largest and most confusing personalities. Haunted by the death of his mother from an early age, Mr. Brainwash picked up a video camera as a way to preserve his memories of family and friends. Mr. Brainwash spent 10 months following Shepard Fairey, the legendary creator of the Andre the Giant OBEY street piece, meeting one street artist after another and logging a tremendous amount of footage, most of which sat in unmarked boxes in his Los Angeles home. He documented the creation of pieces by Buffmonsters, Borf, Swoon, Dotmasters, and eventually, Banksy and “Exit Through the Gift Shop” was born. Soon Mr. Brainwash pursued his own art and enlisted a team to create works around the theme of mind control, his first art show sold $1 million on opening night and ushered the before unknown figure into the spotlight. Gavin Bond expertly captures the spontaneity and fantastic rise of Mr. Brainwash with playful photographs that are almost at outlandish and they are bursting with color.